The specialists at Bromley Car Repairs are experts when it comes to engine tuning. 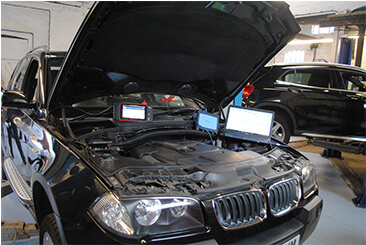 Remapping can improve both fuel consumption and vehicle performance in petrol and diesel engines. As official BHP UK providers, we use their top quality software to ensure your car reaches its potential, delivering both fuel efficiency and power enhancements. Combine this with our own high standards of customer care and quality, and you know you have found the right place for the remapping of your engine. When a car is built, the manufacturers focus is on targeting the average road user, they are often not tuned to highest standard when they roll out of the factory. This leaves us with plenty of scope for improvement, to ensure you get the best from your vehicle. Remapping your engine incorporates updating the software that controls your vehicle’s onboard computer. Due to being able to utilise the latest technology, we can improve both the power of your car and the fuel efficiency, with the potential to provide you with the equivalent power of the next model up, without the expensive upgrade. What are the benefits of a remapped engine? As experts in our field, we know exactly what your vehicle requires in order to get the best from it. To ensure you benefit as much as possible, we’ll give your vehicle a once over before undertaking your remapping and recommend the best option for your vehicle. All drivers are different, and all vehicles are different so it can be difficult for manufacturer’s to build their vehicles to suit everyone. If you drive efficiently already to get the most out of your petrol or diesel, chances are you would see a big difference in the fuel efficiency of your vehicle. By remapping the software to improve the engine economy, you’ll get more for your money at the pump. AIncreased performance means you’ll enjoy driving even more. You’ll notice a smoother ride and improved throttle response. Why choose Bromley Car Repairs? We believe BHP UK remap software is the best product on the market, offering enhanced performance and fuel economy for most vehicles. As we’re a servicing and MOT garage, we can provide your remap at the same time as your vehicle receives it's service, repair or maintenance work. You’ll drive away with your vehicle performing at its very best. As members of the Good Garage Scheme so you can trust us to deliver the best results for your vehicle, every time.